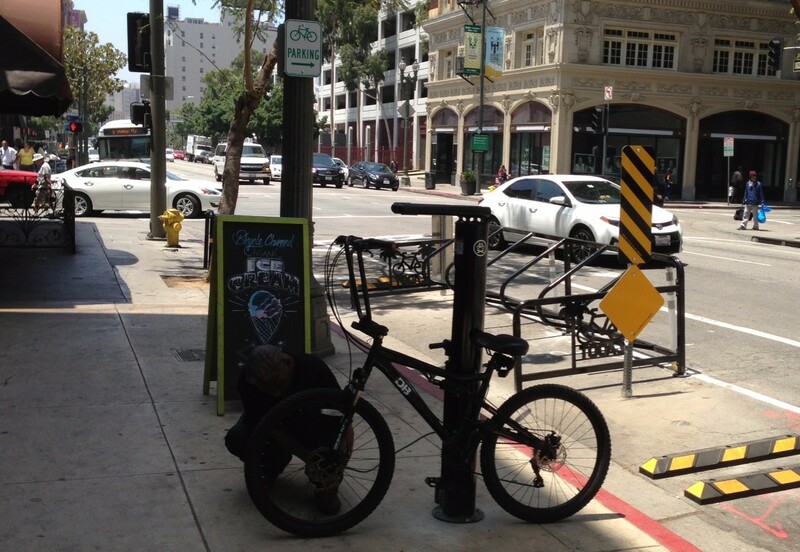 New bike corral and repair stand in front of Peddler’s Creamery in downtown Los Angeles. Photos by Joe Linton/Streetsblog L.A. Correction: Commenter Steven White correctly points out that there are indeed already two on-street bike corrals in the Downtown Arts District. So this isn’t the first downtown L.A. corral – it’s the third, and, AFAWK, it’s the first downtown L.A. corral west of Alameda Street. 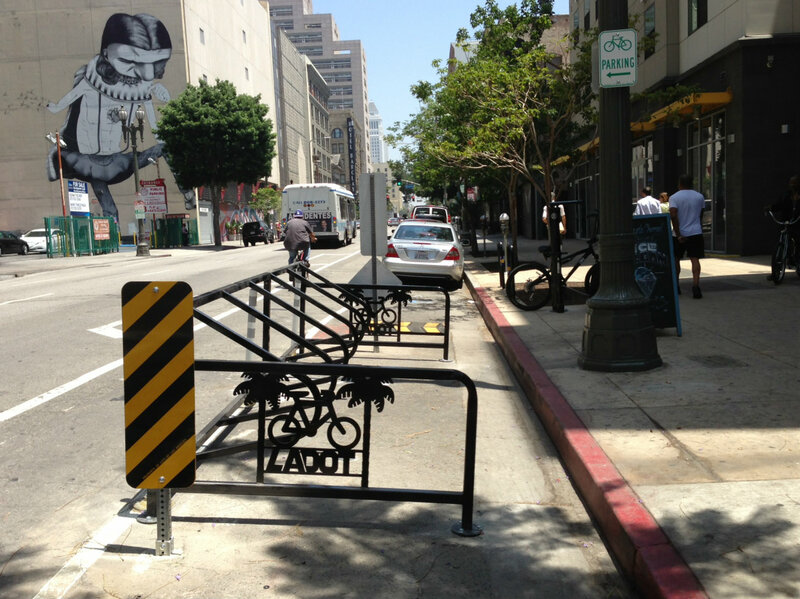 L.A.’s Department of Transportation (LADOT) has installed a new bike corral, the first in downtown Los Angeles. It’s on the east side of Main Street, just north of 5th Street, right in front of Peddler’s Creamery, where the main attraction is yummy “bicycle-churned ice cream.” And there’s more – in addition to the bike parking there’s a fix-it stand with pump and all. According to LADOT Bike Program Instagram, Councilmember Jose Huizar will be there will be at an official opening celebration ceremony today at 4 p.m. If today’s Metro committee meetings end early enough, Streetsblog L.A. will be there to enjoy a scoop or three. If you want a bike corral in front of your business, follow the instructions found on LADOT People St.
Also just added one in front of Pie Hole in the Arts District. And I believe Blue Bottle in the Arts District has had one for a while… so this isn’t really the first in Downtown. The LADOT installs these backwards. The stall should be convenient for someone riding up in the buffered bike lane to just roll their bike in and out of the stall. In this case someone needs to dismount, pick their bike up onto and then off of the curb to get to the rack. Its the only way that senior engineers will sign off on them I’ve been told by folks in the LADOT. The Dero Cycle Stall Elite was designed to be placed with the opening towards the curb. The standard bicycle racks that LADOT uses are placed on sidewalks where you have to dismount and lift your bike on and off the curb when riding in the street. The Dero Cycle Stall Elite is a corral which is designed to keep the removal of bikes away from moving vehicles and also to prevent parked bikes from sticking out into the bike lane or motor vehicle lane. Yeah, the traffic warning signs facing away from traffic on a one-way street does seem to be a bit much. The bike corrals shown in your link are simply U-racks that are in a row on the street. Are you implying that U-racks that are installed on sidewalks across cities throughout the U.S. are in the wrong position because people have to carry their bicycle over the curb to lock up their bikes to the rack if they ride in the street? Also, I’ve used one of the Dero corrals that the LADOT is now installing and I didn’t have to lift my bicycle onto the sidewalk to use it. There is a space between the curb and the corral to move a bicycle in and out of the corral. The point of a corral (besides capacity) is a quick in/quick out. Even if you can squeeze your bike through the gutter into these cages, it still undercuts the efficiency and ease that a corral should be providing. These Dero prefab corrals are 1/3 to 1/2 the cost of installing 5 separate inverted U racks, and my guess is that is the real reason they are getting installed. The corrals are obviously an improvement from a sidewalk rack (or no racks), but I wish LADOT would keep it simple and just install inverted U racks the way they did at Cafe De Leche in Highland Park. LADOT probably got the corral that was installed at Cafe De Leche and the one installed on Main St. downtown from the same company. Dero sells what they call a Cycle Stall Basic which looks like the one at Cafe De Leche and also a Cycle Stall Elite that is installed on Main St. The cost of the Basic corral is not more than the Elite. In fact the Cycle Stall Elite that the LAODT is using has a custom design on both ends of the corral which increases its cost even more. I’ve used the Dero Cycle Stall Elite several times without any problem whatsoever. I found it quite easy to use. The LADOT have even provided enough space on one end to park a extra long or wide bicycle. This link provides the reasons for changing the design and also mentions that the third round of Cycle Stall Elite corrals will have shorter sides to make entry and exit easier. I’ve been using the corrals in Venice and I didn’t give a passing thought about getting off my bike and moving into the corral. It’s super easy and it never entered my mind that it was a PITA to do so. They work really nicely and I also feel as though it’s a smart design to not be street facing, so people don’t block the street or bike lane when wrangling their stuff. In the world of things to complain about, this ranks about #19,346,354 in my listing. fair enough, its definitely a lower ranking item to complain about considering all the other awful things the city does to make biking inconvenient. yes and you get twice the capacity. hard to believe these are cheaper to install than u racks. This corral actually looks kinda nice. This is coming from someone that has a few in their town (LB). These look alot better than the, I don’t know, props to cars? The one on 1st in LB looks rather pathetic and I can’t image anyone that’s a driver thinking that was nice gesture. If I was doing something like that I would have done something that you would actually walk inside of. Something that would look close to a van’s outline. Maybe everyone could have a good chuckle over. OK I’m getting a little off track here. Great job, I hope it gets well worn. That’s the only sign I could think of a properly set out corral. But at the same time I feel like we, as bicycle advocates, should get behind infrastructure like this which serves (1) the practical purpose of providing secure bike locking, but also (2) to send a public message that bikes belong on the road, and i think taking a former parking spot and turning it into a bike corral sends that message.